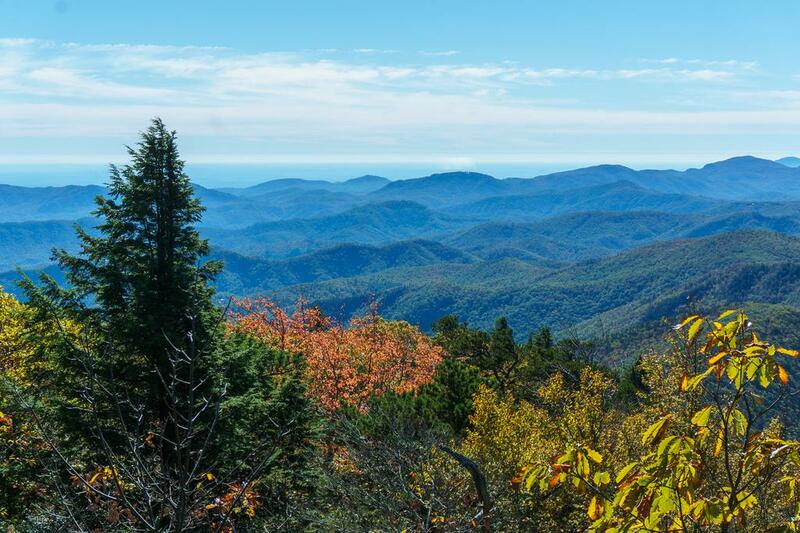 A fantastic, classic summit hike starts in the shadows of a deep valley and culminates atop one of Western North Carolina's preeminent 5000-footers. 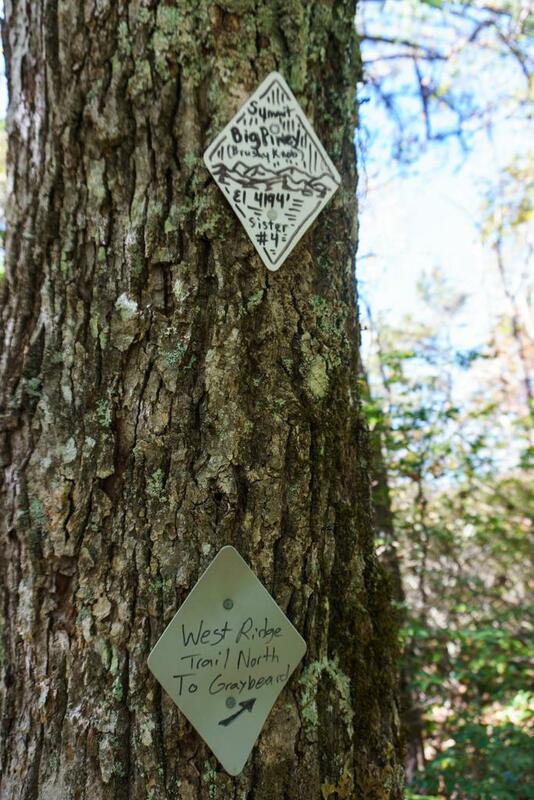 The hike features widely varied scenery in an area managed as wilderness, yet the trails are well marked, blazed, an maintained. Follows a historical railroad along one particularly enjoyable segment. 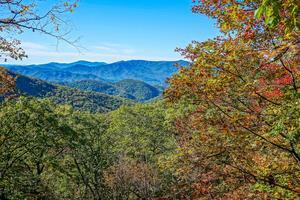 Features streamside forest scenes, a small waterfall, and panoramic views from the high points. 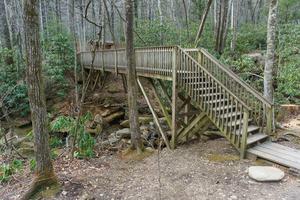 This hike has a loop option for those looking to add a bit more adventure to the trip. 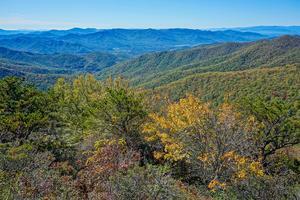 From Asheville, take I-40 East about 11 miles to Black Mountain, exit 64 for NC Hwy. 9. Turn left at the end of the ramp and go 0.5 mi into downtown Black Mountain. Continue on NC 9 across State St. (it's a slight left through the intersection) and go 1.7 mi to the stone arch gate at Montreat. The road's name changes to Assembly Drive at the gate. Continue 1.1 mi on Assembly Drive, past Lake Susan. Assembly Drive curves right; go straight/slight left onto Graybeard Trail. 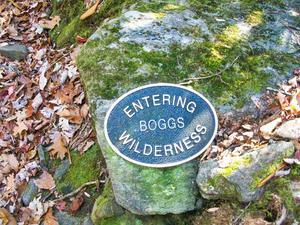 It's 0.8 mi to the parking area, on the right at the Walk Jones Wildlife Sanctuary where the road turns to gravel. 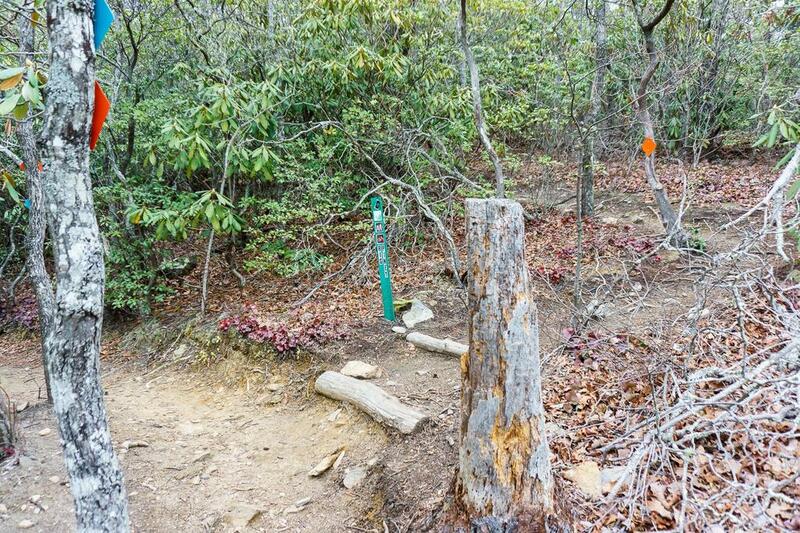 The trailhead is just ahead on the right. Graybeard Mountain, the grandfather of the infamous Seven Sisters Ridge (or Middle Mountain by official maps) represents one of the best opportunities for a summit climb in the Swannanoa Vally area of eastern Buncombe County. 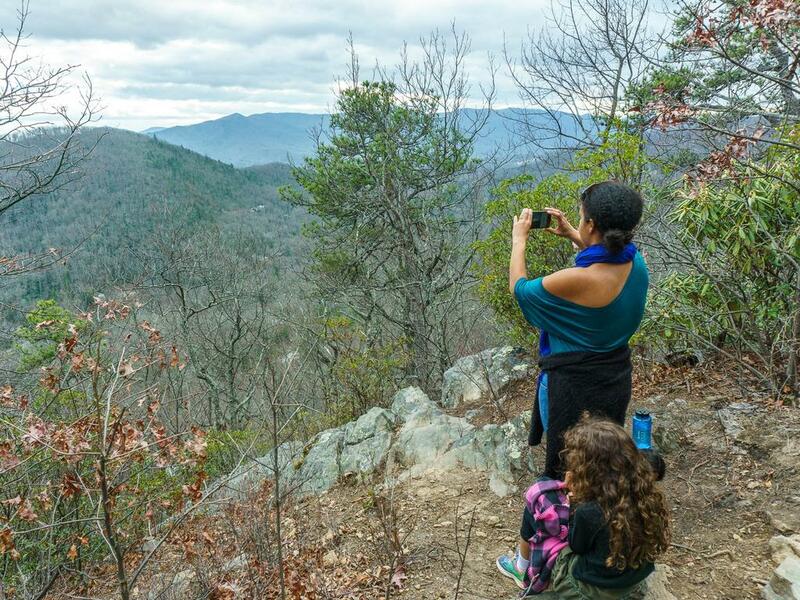 Climbing above the town of Montreat to a lofty elevation well above 5000 ft, Graybeard is one of the region's preeminent peaks, made even more popular by its quirky name and being a named feature on a Blue Ridge Parkway overlook farther west. Though private property, Montreat is generously open to hikers. 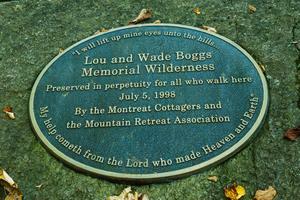 The Montreat wilderness makes a fantastic setting through which a well-maintained trail winds its way up to the summit. 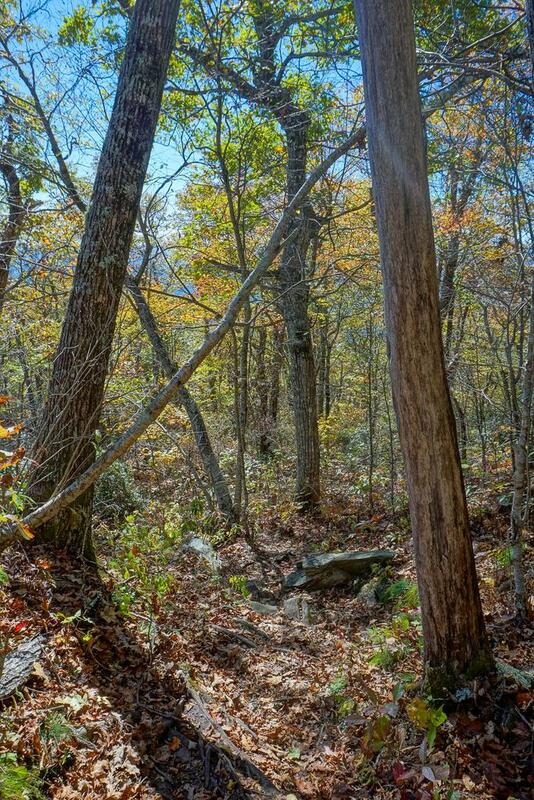 And by combining the trail with some others, you can turn this into a more difficult loop hike, perfect for those looking for a bit more of a challenge. 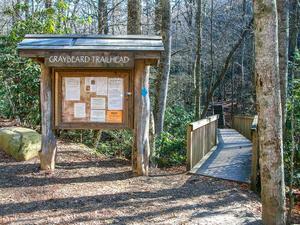 Information sign and bridge at the Graybeard Trailhead in Montreat. 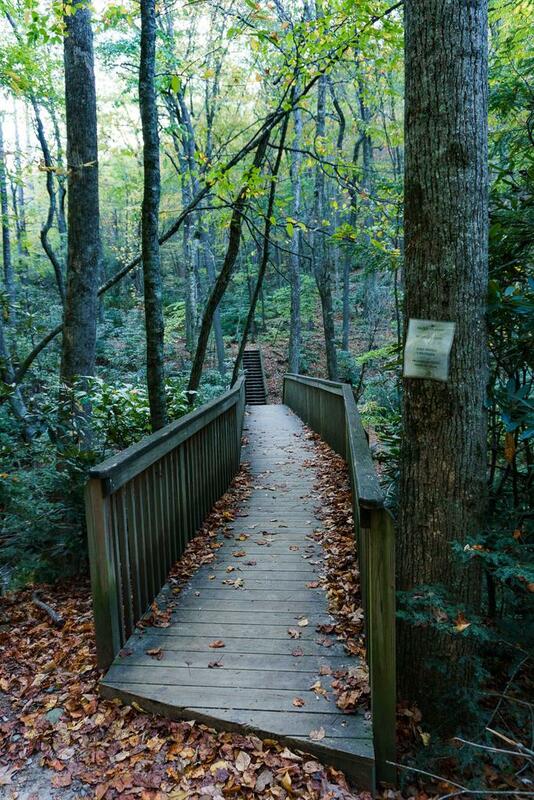 Start the hike on the bridge to the right of the trailhead sign at the upper end of the parking lot. 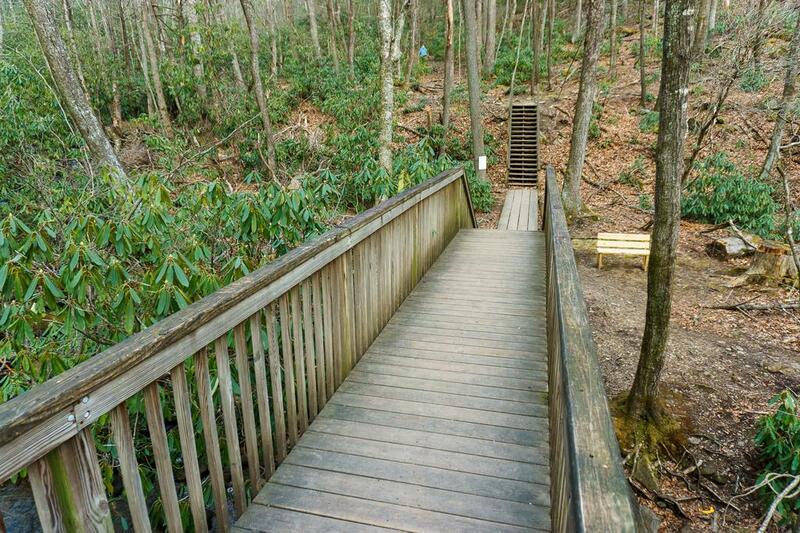 The trail immediately crosses a high bridge over Flat Creek, descending on a set of wooden steps on the other side, then immediately ascending another set of steps to climb up from the waterway's ravine. It angles northeast on the east side of Flat Creek, and begins climbing upstream. 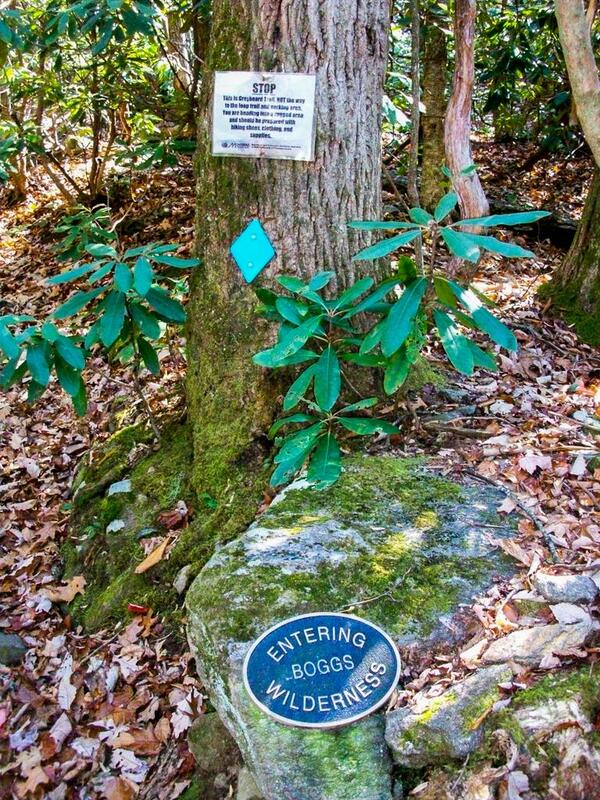 The forest is filled with an understory of rhododendron, which partially blocks the view of a Montreat neighborhood across the creek. The trail is a purpose-built path at this point, with a few roots an rocks to contend with - a nice warm-up for what's to come. 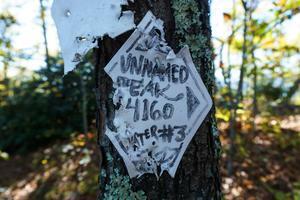 You'll reach a well-signed junction with the Harry Bryan trail and an old road in 0.4 mi. 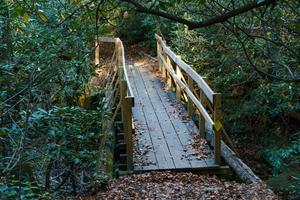 To the left, a footbridge takes the Harry Bryan trail across Flat Creek. 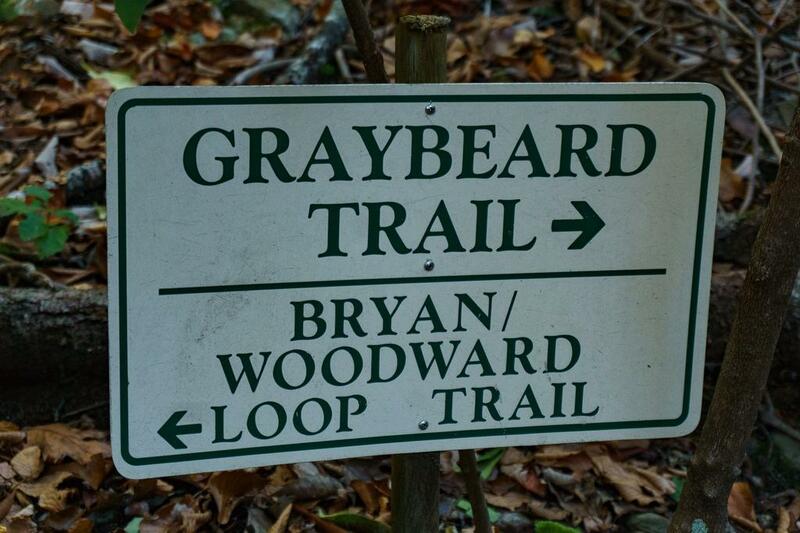 Keep right, uphill, to continue on the Graybeard trail. 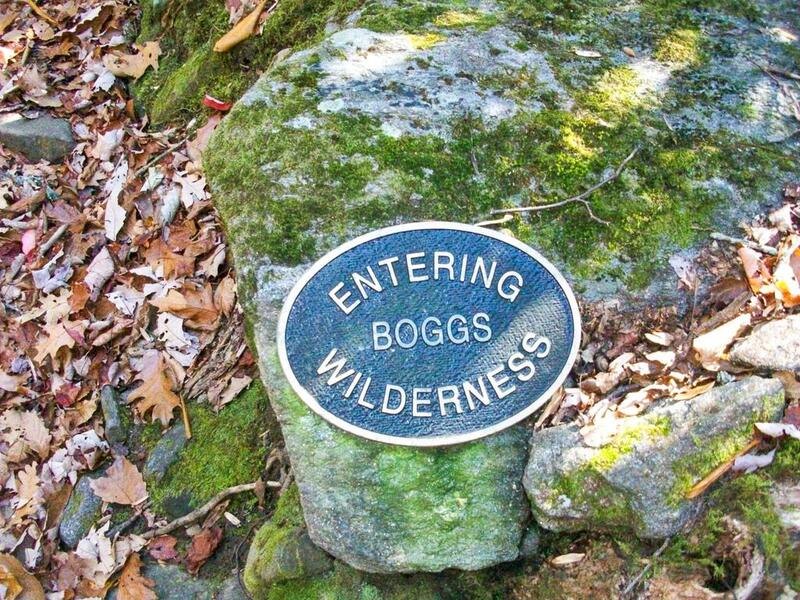 The trail enters the Boggs Wilderness - you may see a sign for that on a mossy boulder to the right just past the Harry Bryan intersection. 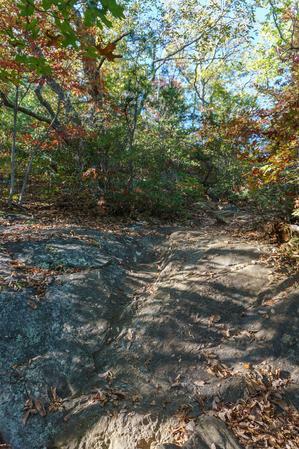 Climbing moderately, the trail now follows the old road uphill toward the location of an old reservoir. 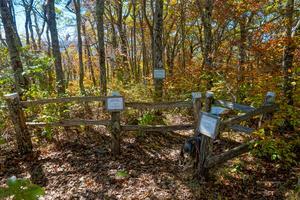 A couple other old roads veer off in various directions; the main trail is well marked and easy to follow, however. The trail approaches and then crosses to the west side of Flat Creek; it follows an old road for a short distance on the other side but shortly devolves into another purpose-built footpath. It's fairly steep in places. The lower cove portion of the Graybeard trail near Flat Creek in fall color. The trail crosses back to the east side of Flat Creek and then back to the west side once more, where you'll stay from here on out. 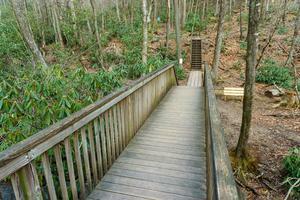 The trail loops through a couple of switchbacks and rises fairly high above the creek. The forest takes on more of an open character, and it's around this point where you start to feel the wilderness setting. Aside from the trail itself and other hikers you may encounter, thee's little evidence of modern society at this point. 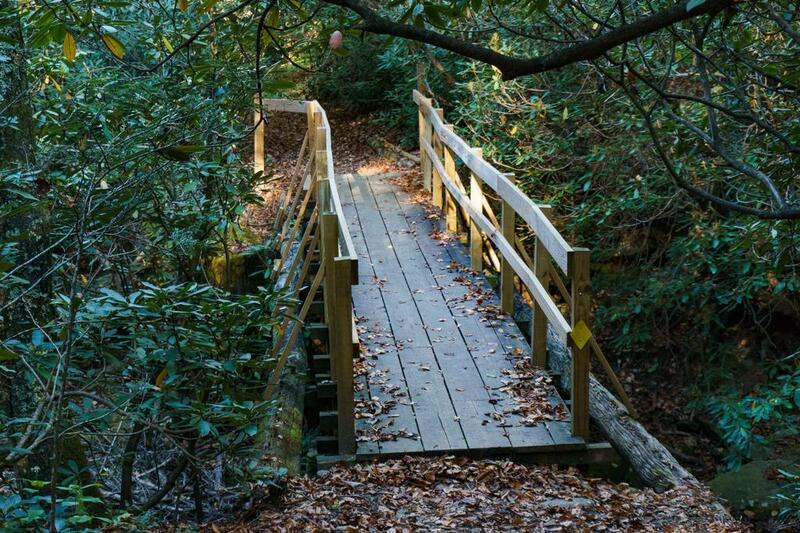 It's 0.8 mi from the Harry Bryan trail to the next junction, with the Old Trestle Road trail. As its name suggests, Old Trestle Road is an old narrow-gauge railroad - specifically, the one that used to take trains from Black Mountain to Camp Alice in the Black Mountain range some 6 mi north (as the crow flies). 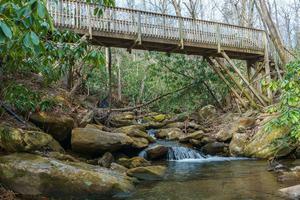 To the right, the Old Trestle Road crosses Flat Creek and ascends to Pot Cove Gap. 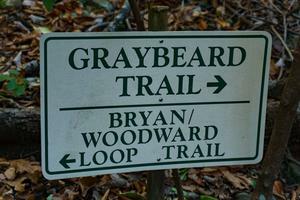 For this hike, turn left (west) onto the old railroad bed, following the signs and blazes for the Graybeard trail. Since this is an old railroad bed now, the trail becomes wide and ascends on a very gentle grade. 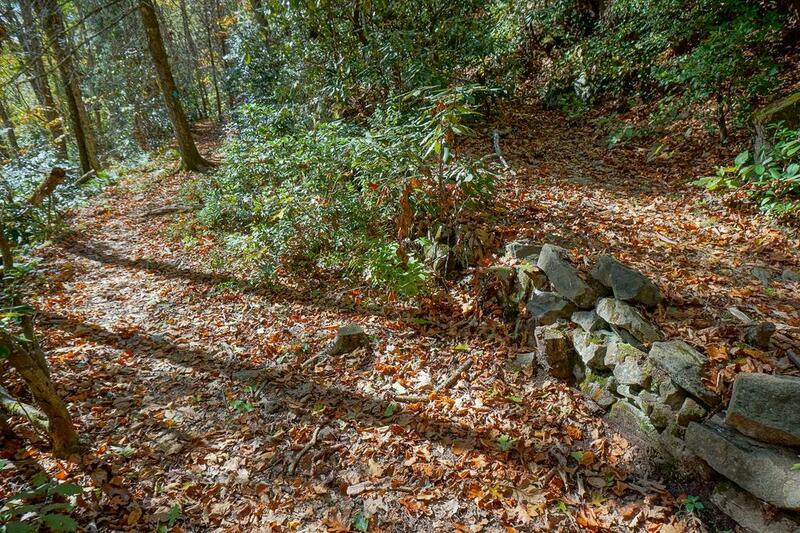 The next 2 miles of trail are shared with the Old Trestle Road along a section known as "the switchbacks" since it passes through several of those. It's one of the most pleasant stretches of the hike, and you can pick up speed and cover some distance here. 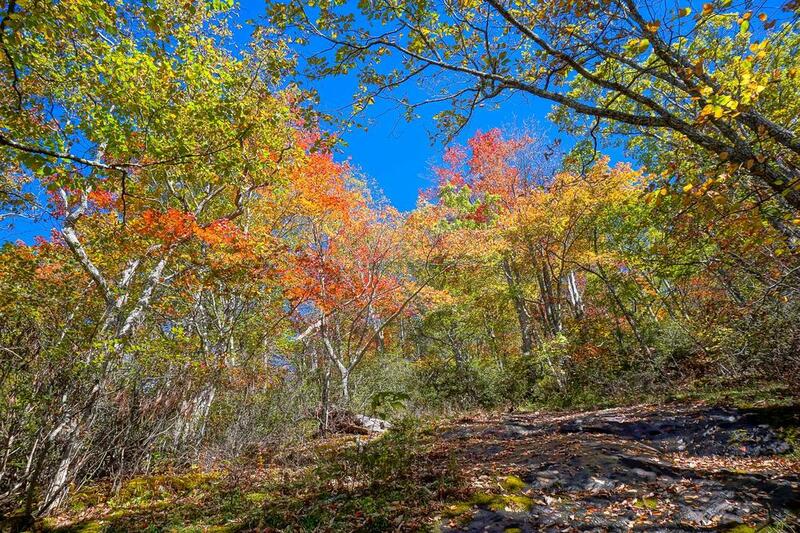 You'll be climbing the south slopes of Walker's Knob, which itself is a high point off the side of Graybeard Mountain, about midway to the lower peak's summit. 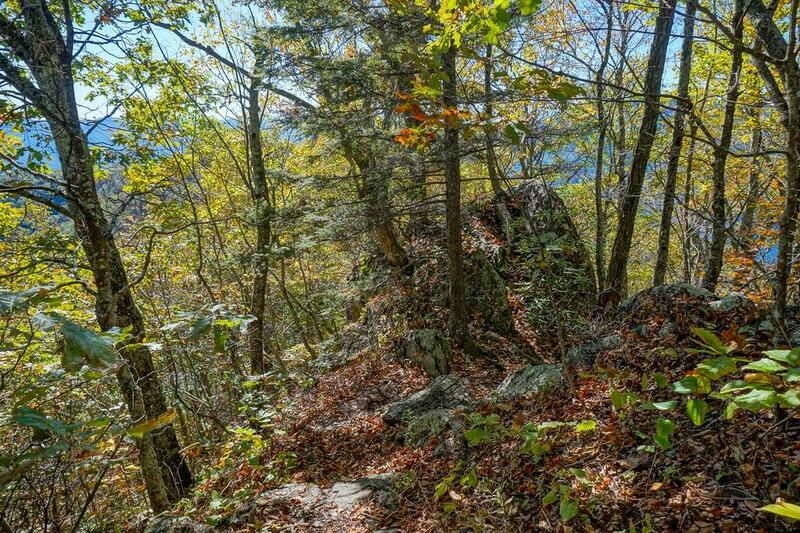 The trail passes above a large rock outcrop on the nose of the ridge with a decent view toward Black Mountain just before the next switchback, to the east (right). 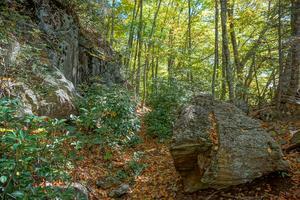 As the railroad climbs past the same rock feature a second time only slightly higher in elevation, it goes through a big cut where the trail threads its way through some big boulders. It then swings around to the north and approaches Flat Creek once again. 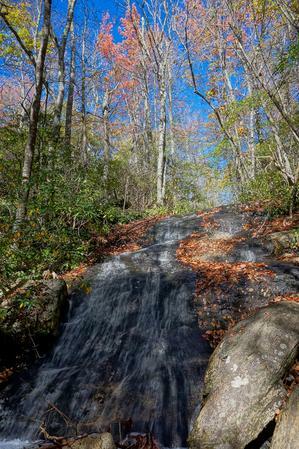 Graybeard Falls on Flat Creek, about 100 ft from a switchback on the Graybeard trail, seen here in fall color. 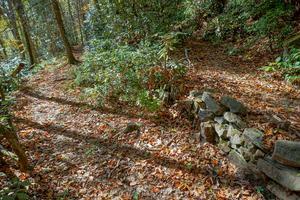 At the next switchback, to the left (south), a dry-stacked stone wall separates the two levels of the old railroad grade. Straight ahead (and at the end of each switchback, in fact) is a siding, where the trains used to pull in to a stretch of track and allow the operator to throw the switch to begin the next leg of the journey up or down the mountain, with the train now going in the opposite direction. 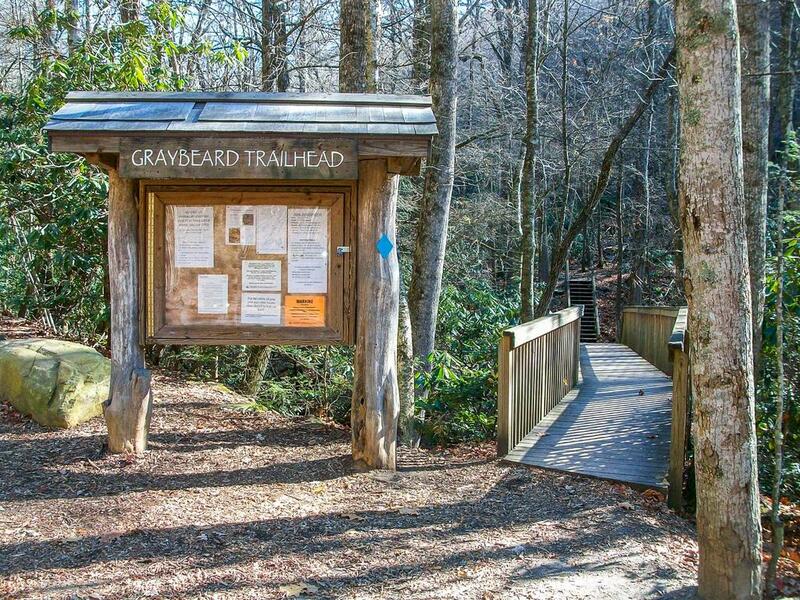 Here, you can follow a level path straight through the old siding toward Flat Creek to reach Graybeard Falls, a small sliding cascade, in less than 200 ft. It's probably not worth hiking all the way up here just to see this waterfall. 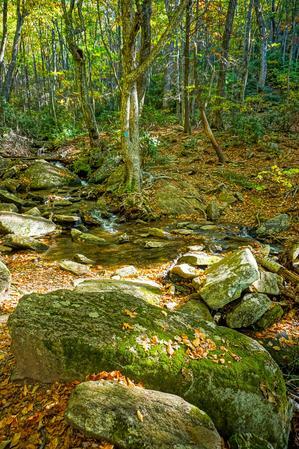 But, as a side trip while you're already hiking the Graybeard trail, it makes a nice rest stop along the way, especially at times of high water. 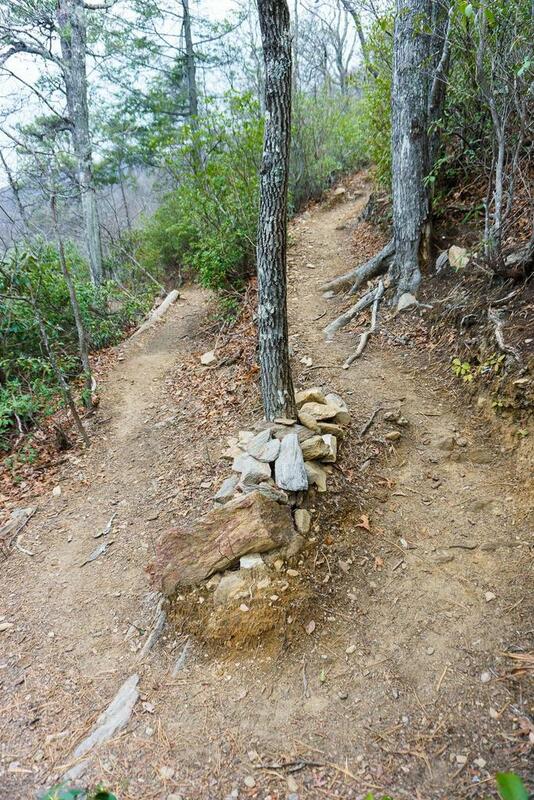 Return to the switchback when you're done. Continue on the upper leg of the switchback, heading south, gently uphill. 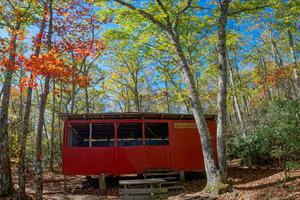 The old railroad and trail now passes through and a drier forest composed of Shortleaf Pine and mountain laurel. 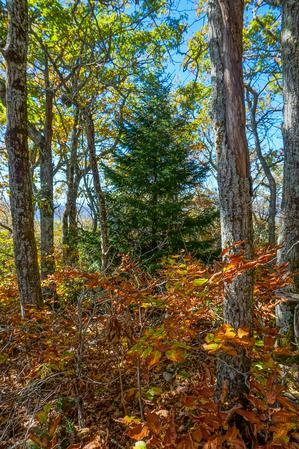 A few hemlocks survive along the trail in places; it remains to be seen whether they'll live long enough to dominate the canopy thanks to the Hemlock Wooly Adelgid infestation. After the last switchback to the right (north) you'll approach Flat Creek once again. 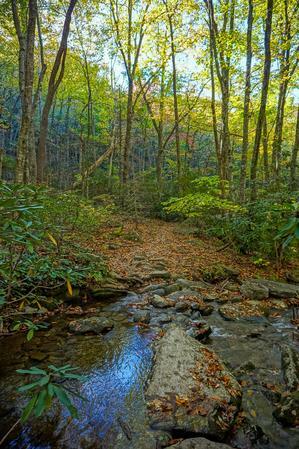 Straight ahead, Old Trestle Road continues across the creek as it approaches the 4500 ft elevation mark. 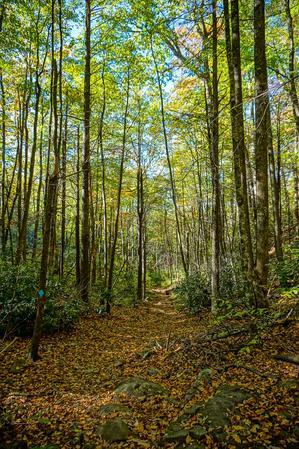 The Graybeard trail splits off to the left just before the creek crossing; follow the signs and blue blazes to stay on that trail. 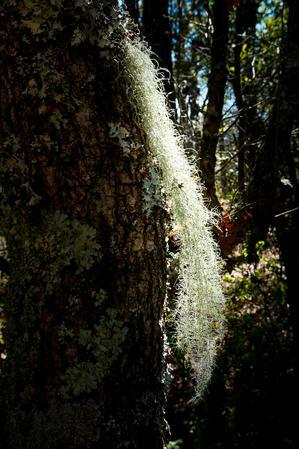 The trail now climbs moderately again near the upper sources of Flat Creek. It's wet and muddy in places as it winds around toward a small gap, eventually heading in a southerly direction once again. 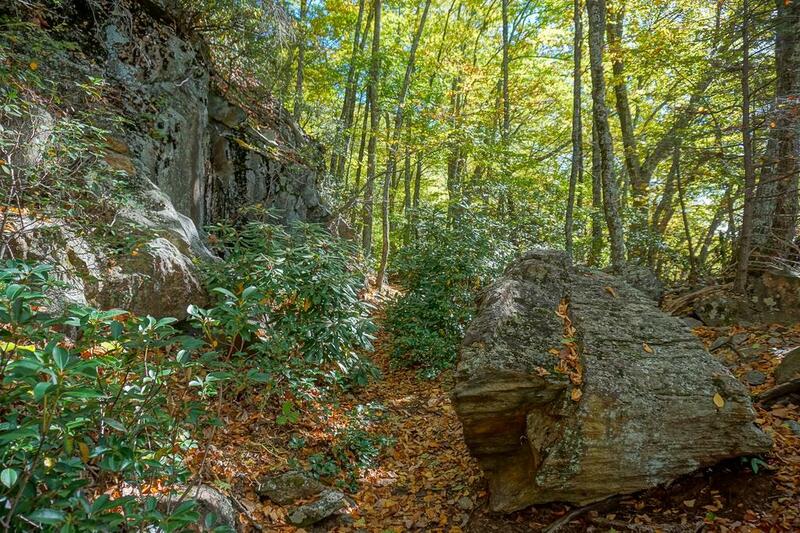 As you crest the gap 0.3 mi after leaving the Old Trestle Road, you'll reach the junction with the orange-blazed Walker's Knob trail and shelter site. The Graybeard trail turns right (northwest), but the side trail to Walker's Knob is only an easy 0.4 mi round-trip. 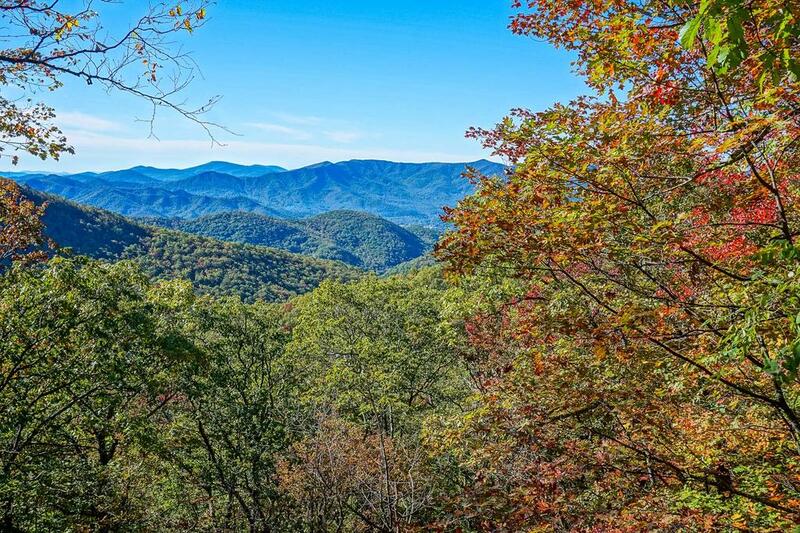 Walker's Knob provides the sweeping southerly views to Graybeard's northerly ones, so it's well worth the small extra effort to reach it. 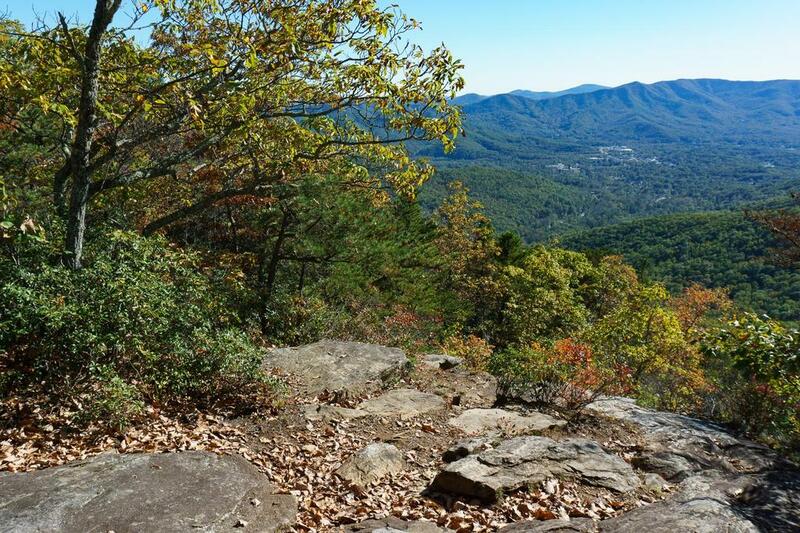 (In fact, many people make this the destination of their hike - I think it makes a great lunch spot for a Graybeard hike). 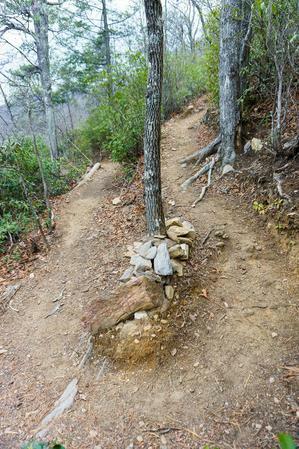 Use caution on the rocks at the overlook on Walker's Knob since there is a decent drop-off beyond them, and when you're done, return to the shelter and the Graybeard Trail. A dead and living tree form a passage on the upper section of the Graybeard trail. Walker's Knob shelter sits at an elevation of about 4725 ft, so you're now about 700 vertical ft below the summit of Graybeard. 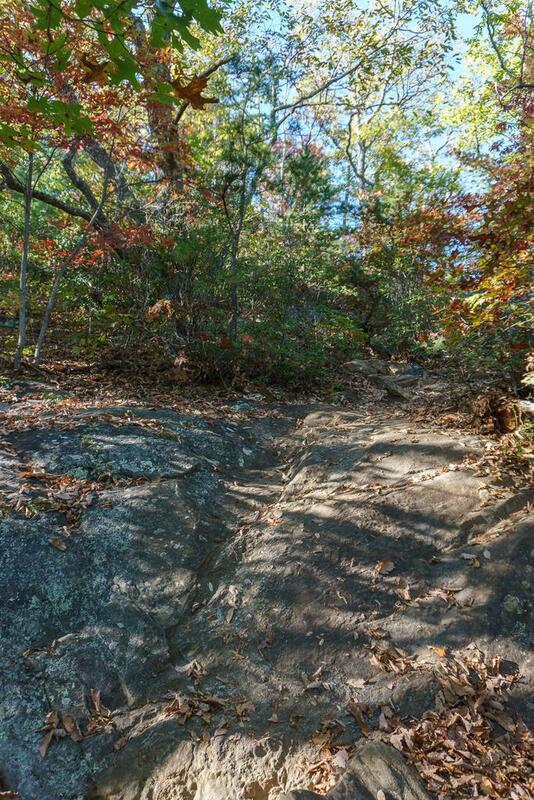 And the trail resumes that climb immediately after swinging northwest from the shelter site. 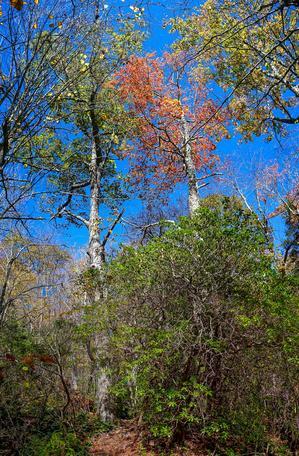 The trail generally follows the ridge here, through a forest increasingly populated with high-elevation beech and birch trees (but still mostly oaks). A few isolated Red Spruce trees appear as well, patiently growing towards the forest canopy layer where they can emerge into full sunlight and (hopefully for them) become seed-producing giants. 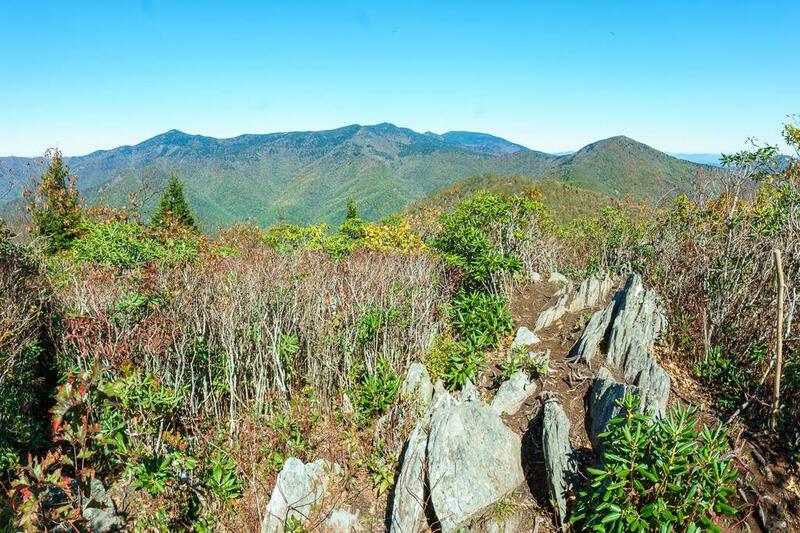 The trail falls off the right (east) side of the ridge one more time as the ridge crest steepens toward Big Slaty Knob, also known as False Graybeard. 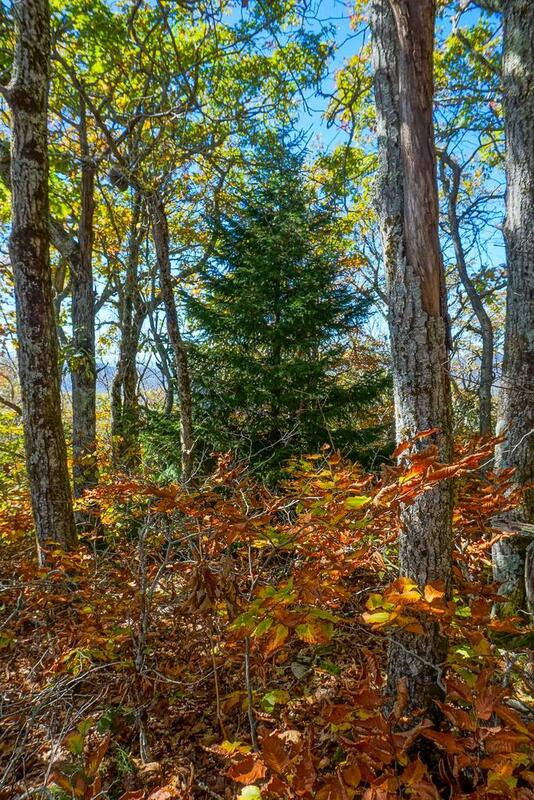 You'll reach the summit of Big Slaty and the junction with the West Ridge trail 0.5 mi past the Walker's Knob shelter in a stand of beech trees, and a post-and-rail fence appears on the left side of the trail, partially blocking access to the West Ridge trail in that direction. The fence and trees are plastered with numerous signs warning about the dangers of the West Ridge trail, how it is neither the route to Graybeard nor the easiest way back to Montreat. 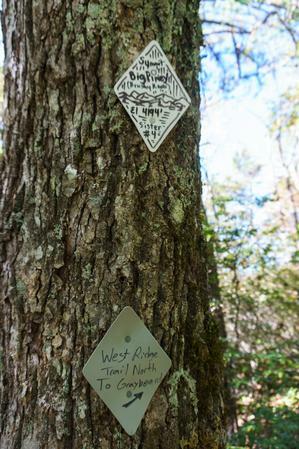 In fact, the West Ridge trail is a viable alternative (albeit slightly more difficult) on the return trek when combined with the Big Piney Ridge trail. But you can make the decision whether to take that route later; for now turn right to continue up to Graybeard's summit. The trail descends slightly as it follows the ridgeline north to make the final 175 ft climb over 1/4 mi. 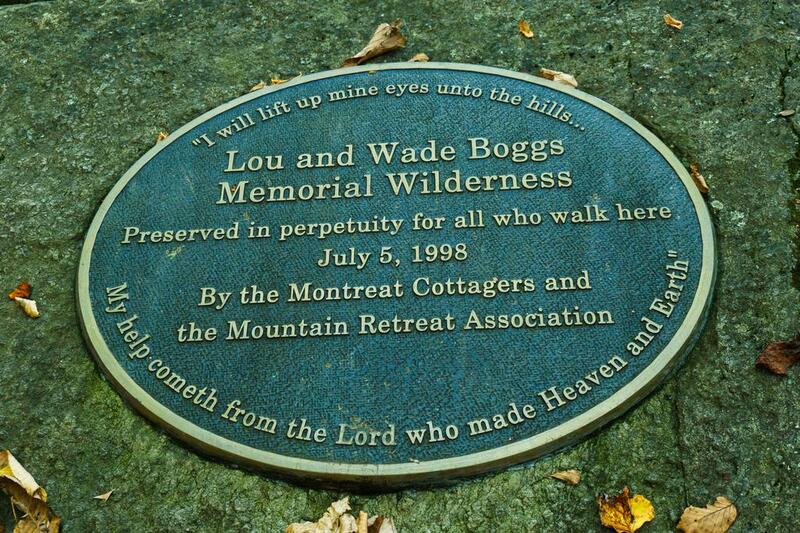 The trail swings left just before the summit on a sharp ridge, culminating at a rock outcrop in a clearing through the brush facing north with a fantastic view of the Black Mountains and Mount Mitchell to the north, Rocky Knob and Pinnacle on the Blue Ridge leading up to them from Graybeard, and the Great Craggy Mountains connected to the Blacks to the east. Panoramic view north from the summit of Graybeard Montain, including the Great Craggy Mountains range (left), the Black Mountains with their signature dark forests, and the Blue Ridge including Pinnacle on the right. 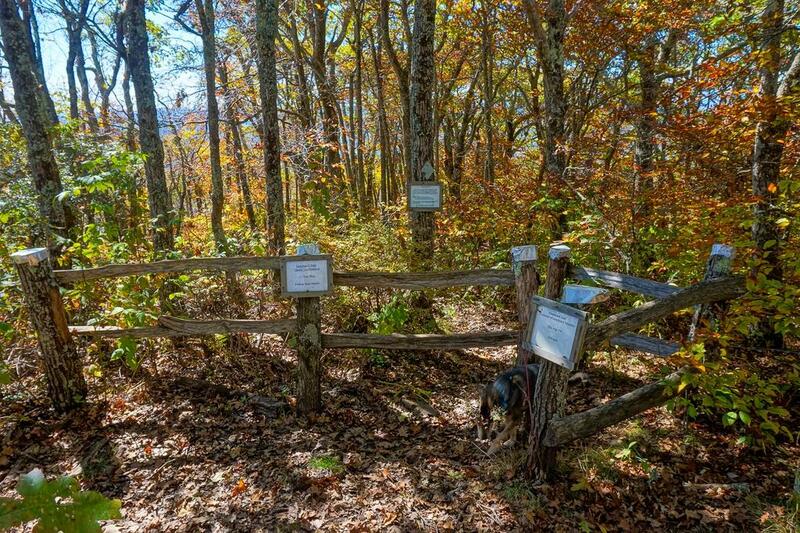 When you're finished soaking in the view, return down the same path to the fence and West Ridge trail junction on Big Slaty. 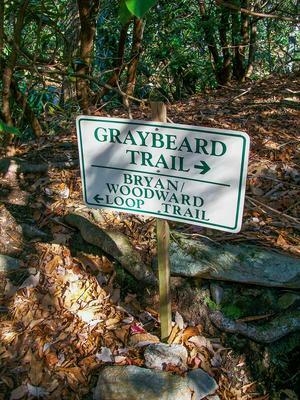 If you're feeling ready to be done hiking, turn left onto the Graybeard Trail and follow the same path you climbed to return to your vehicle and finish the hike. That's the easier route. 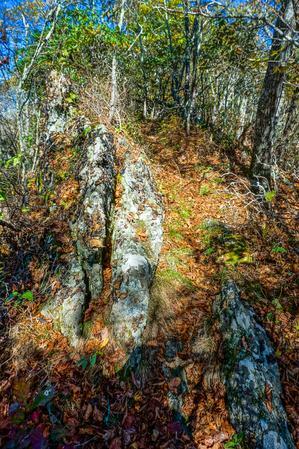 The rocky spine of Montreat's west ridge, or Middle Mountain, which the West Ridge trail traverses, pokes through here and there. 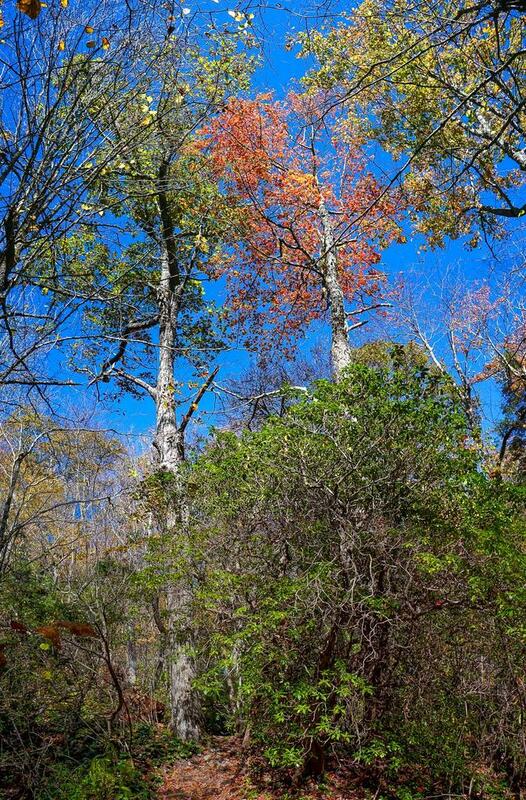 Some big trees grow in its soily clefts. If you've still got some energy and would like to spice up the hike a bit, you can add a loop to the return portion. 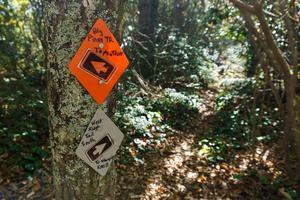 Consider reading the signs at the West Ridge trail first. 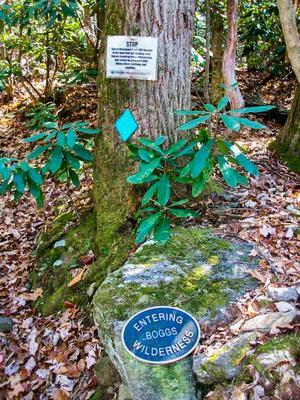 They're likely to sound discouraging, as they were installed to prevent folks from getting into trouble by haplessly missing the turn and winding up on a rougher, unfamiliar route when all they wanted to do was hike to Graybeard and back. The loop route is indeed narrower, rougher, and slightly overgrown in places by late summer. 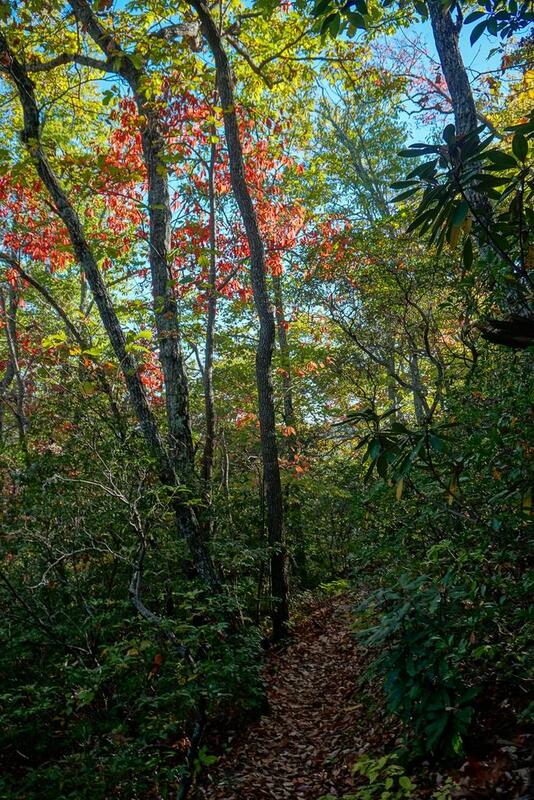 It's roughly the same length as the Graybeard trail (a wee bit shorter, in fact), but it loses all of its elevation in short, steep bursts. 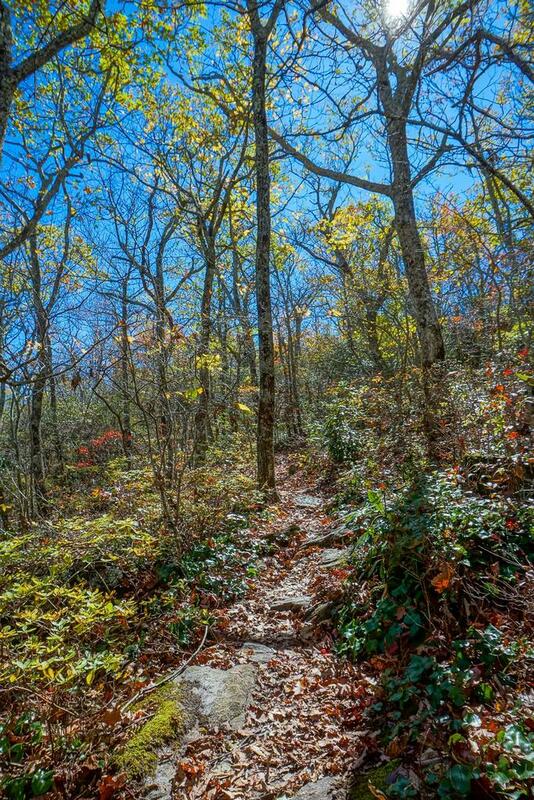 But any experienced hiker should have little difficulty navigating it, and the change in scenery on the way back down enhances the hike for me. 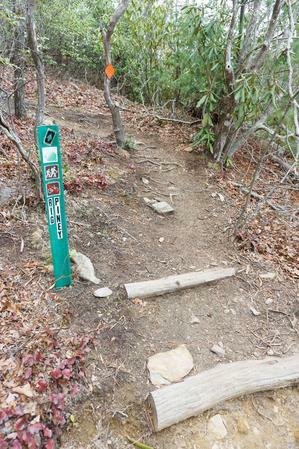 If you want to go that way, walk through the fence and begin descending the ridge on a much narrower, lightly used trail. 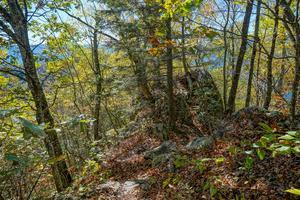 The West Ridge trail is steep in places, and it descends over rock outcrops and boulder fields. One in particular presents as almost a cliff, though it's not quite as high as the trees and so doesn't appear to rise above them from afar. 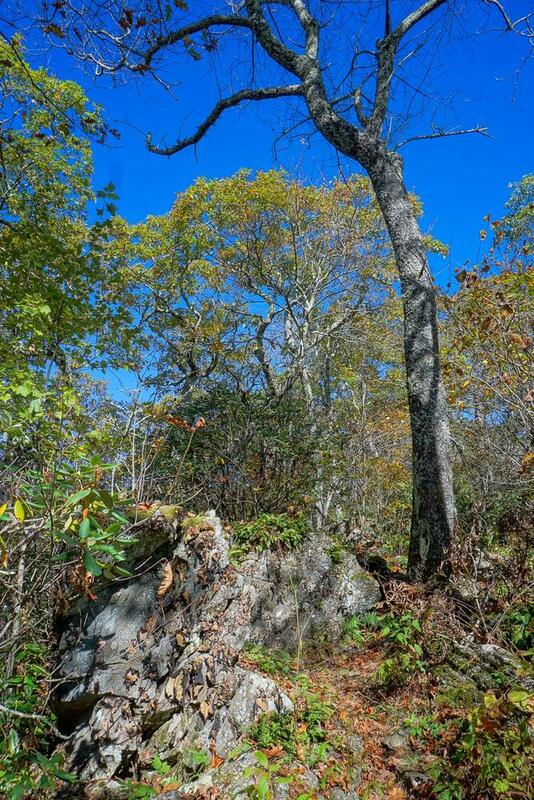 Keep right at this outcrop to find an easier path that winds down around the boulders rather than the more obvious steep drop directly through them. (Speaking of trees, some of them up on the ridge here are enormous and gnarly-looking). 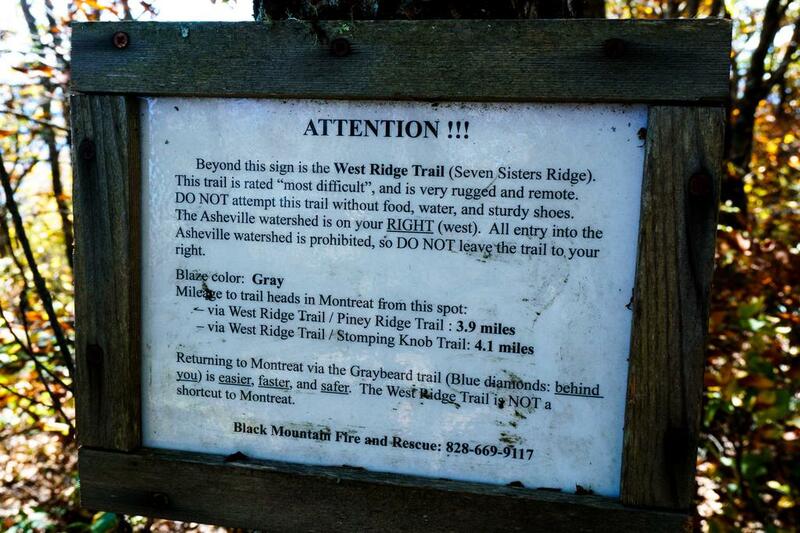 To the right of the trail is all Asheville Watershed property where public access is prohibited, so be sure to stay on the trail to avoid trespassing. You may catch glimpses of the Asheville reservoir through the trees in winter. Big Slaty marks the northern end of the Seven Sisters, a long mountain ridge that climbs up from near Black Mountain to Graybeard with (roughly) seven prominent summits visible from the areas in town. 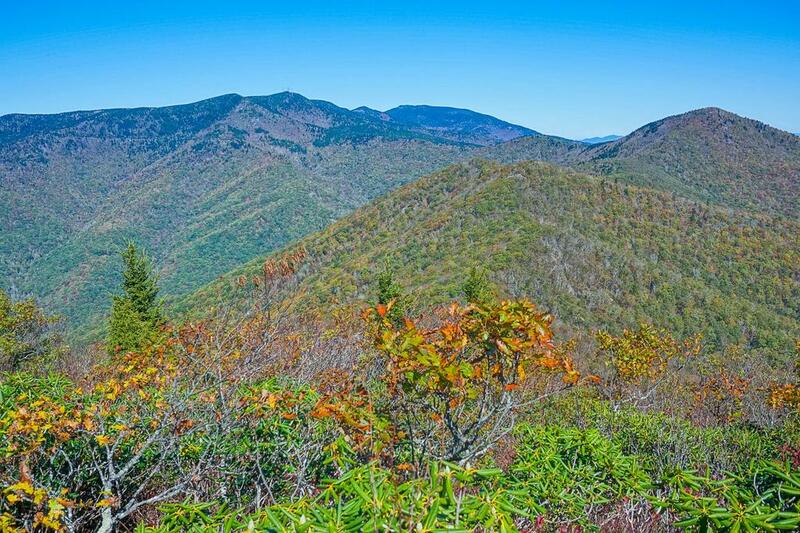 You'll begin crossing the "sister" peaks in descending order, starting with #7 - Big Slaty, which sits above Walker's Knob. Since Big Slaty rises only about 15 ft above the ridge, it's essentially just the shoulder of Graybeard, but it appears "peak"-y enough from afar to get a Sister designation from most viewers' perspective. In fact, none of the peaks are particularly impressive when climbing down over them in this direction, appearing only as slight rises as the trail reverses briefly from an overall descending to an ascending trajectory. 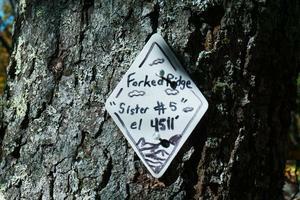 And there are smaller rises all along the ridge that don't get a "Sister" designation. 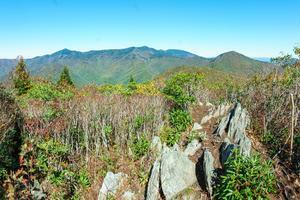 Still, the ridge itself is rather scenic and rugged in spots, making this an enjoyable route to hike. 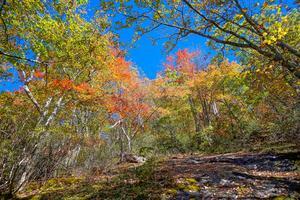 Fall color around the rocky spine of Middle Mountain. 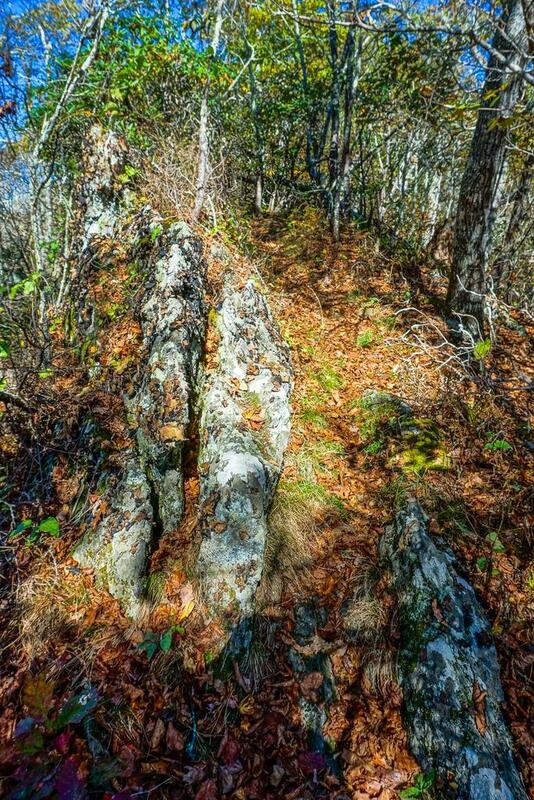 Next, the trail descends somewhat steeply down to Sister #6, Little Slaty, at the head of an unnamed ridge north of Fork Ridge. 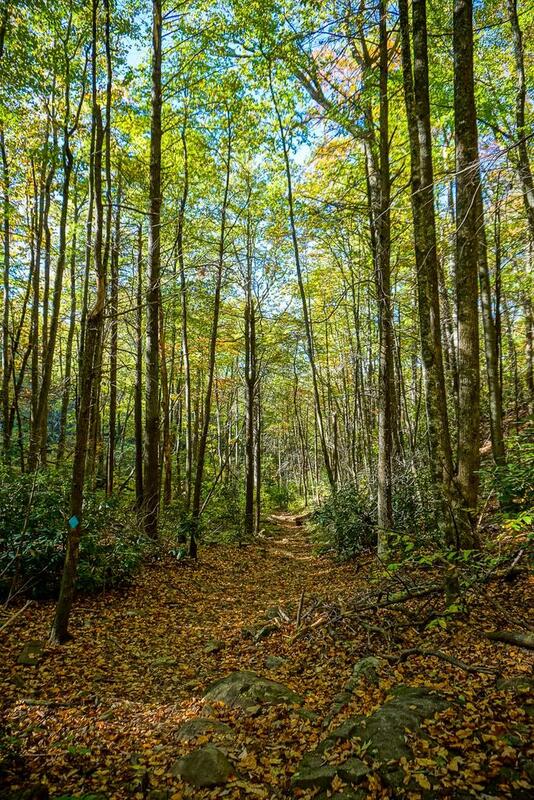 The downward trend moderates somewhat and the trail even climbs noticeably again as you cross "Point 4380" (a tiny rise at the head of Slaty Branch which usually doesn't get a Sister designation) and then Sister #5 which is at the junction with Forked Ridge. Next comes Sister #4, an unnamed peak at the junction with a side ridge coming up from the west and helping form the dam on Asheville's North Fork Reservoir. Lastly, you'll reach Sister #3, or Brushy Knob, or Big Piney, depending on who you ask. 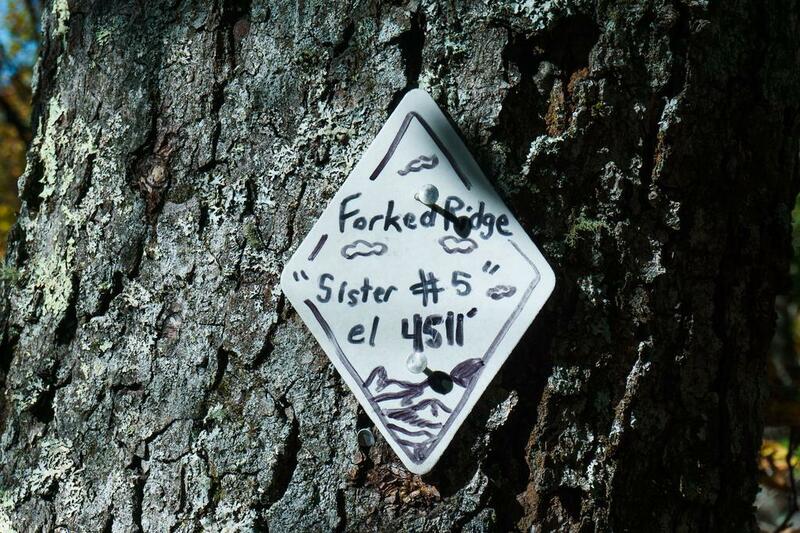 That's the last Sister you'll cross on this hike, though the West Ridge trail does eventually continue on to #2, or Little Piney. Junction of the Big Piney and West Ridge trails on Stomping Knob (also known as Big Piney). 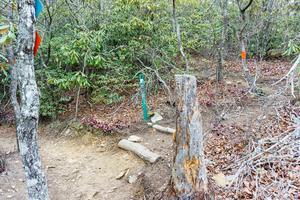 The junction with the Big Piney Ridge trail near the summit of Big Piney is reached 2.1 mi from the Graybeard trail. Turn left off the West Ridge trail to begin a steeper descent down onto that orange-blazed trail's namesake ridge. 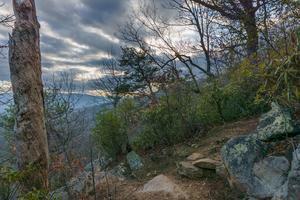 The initially steep drop moderates some as the Big Piney Ridge trail passes the top of Rattlesnake Rock, which provides another fantastic viewpoint off to the south. 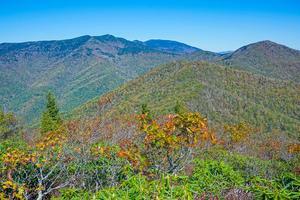 View of Black Mountain from Rattlesnake Rock, near the top of Big Piney Ridge, on the Big Piney Trail. 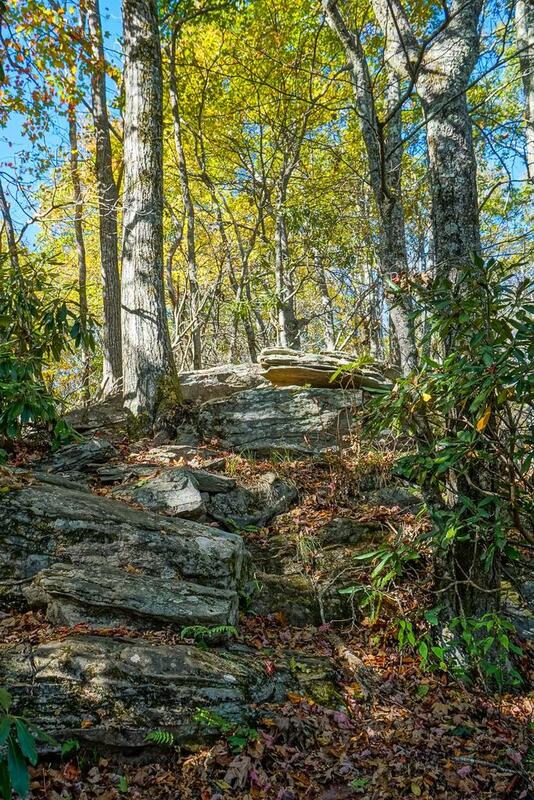 Log steps at the end of the Big Piney trail, looking back uphill from the Lower Piney trail. The trail then passes through its namesake pine forests atop the ridge beyond the rock, a much different scene than any of the forests you've encountered thus far on the hike. Wintertime views of Montreat have thus far shown it to be distant and far below you on the West Ridge portion of the hike; finally the houses and buildings appear a bit closer as the trail steepens again in its descent of Big Piney Ridge. The trail passes through a few switchbacks and some stretches of bedrock which are steep enough to warrant close attention and hand-holding - almost what you'd call a rock scramble. 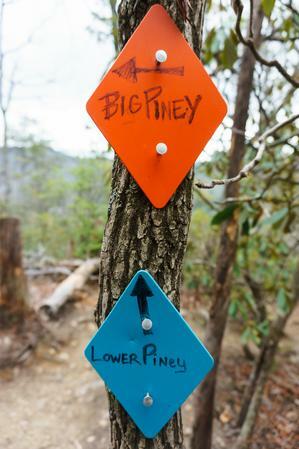 1.6 mi from the West ridge trail, the Big Piney trail ends at a set of steps and the junction with the Lower Piney trail. Turn left, downhill, to start the final leg of the hike back to civilization. 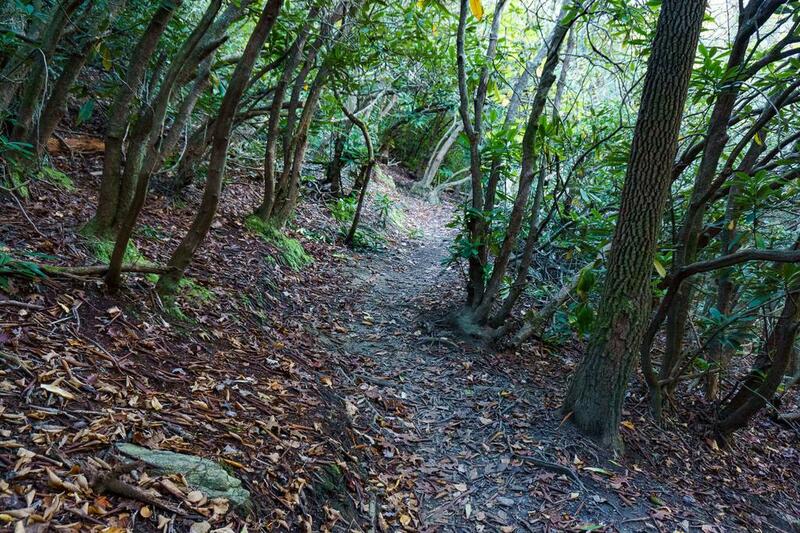 Another view opens up on the right among some switchbacks, then the trail winds in and out of small rhododendron-filled ravines as it approaches the trailhead on Suwannee Drive above Big Piney Branch 0.5 mi from the Big Piney junction. At the Suwanee Drive, continue straight (downhill), cross a branch in a Montreat neighborhood, and reach the main road after 0.2 mi. Turn left, uphill, and walk the main road another 1/4 mi to reach the parking area and finish the hike. 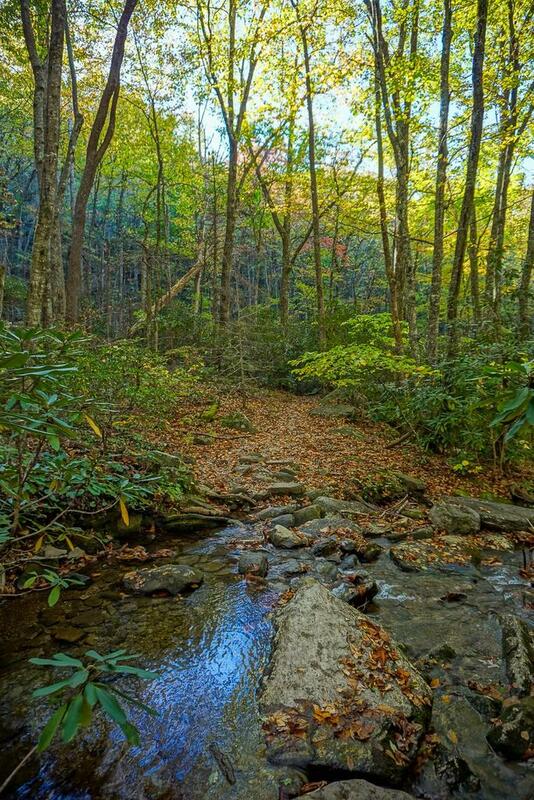 Charlotte Bob said: We hiked the Greybeard trail on Saturday , 11/24/18, from the trailhead in Montreat to Walker's Knob. My son used his Fitbit to measure the distance , one way it was 5.25 miles, or 10.5 miles round trip. We hiked at a fairly aggressive pace as to beat darkness on the return hike. It took us 4.5 hours total. 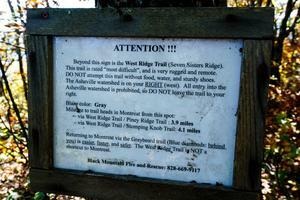 The posted descriptions of the trail are accurate. The trail starts out moderate to strenuous then transitions to a moderate ascend, with switchbacks. 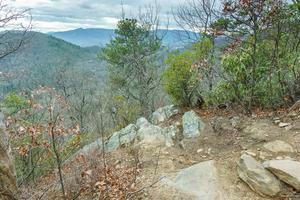 It was a mostly cloudy day so the views were not optimal but the hike was still rewarding. 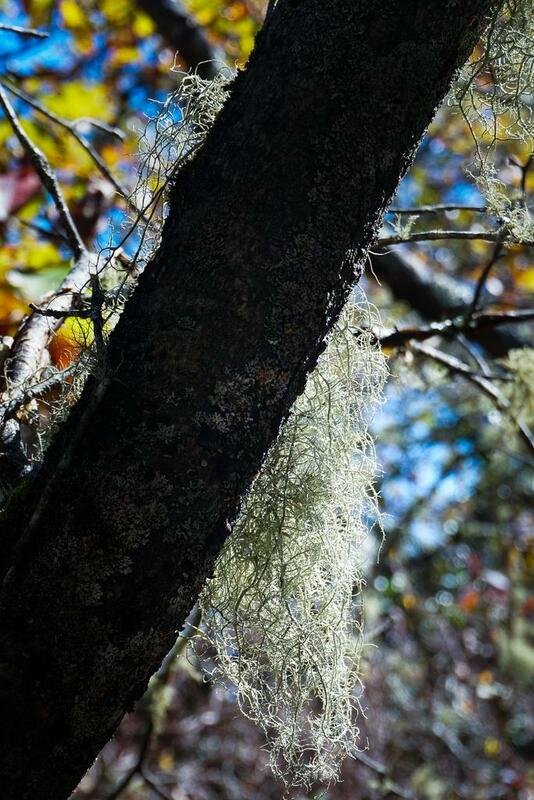 Will hike Greybeard again.